Honey Pecan Almond Cheesecake Sammy Bites | sandwich surprise! Ahhh, Thanksgiving. I cannot wait another three weeks for the holiday deliciousness to ensue. Luckily, it’s Let’s Lunch Friday*, and our theme this month is food we love to share with family and friends, so I baked up a Turkey Day preview: my secret almond cheesecake recipe. I upped the ante this time around by adding spreadable raw honey and chopped toasted pecans on the sides of the cheesecake squares. 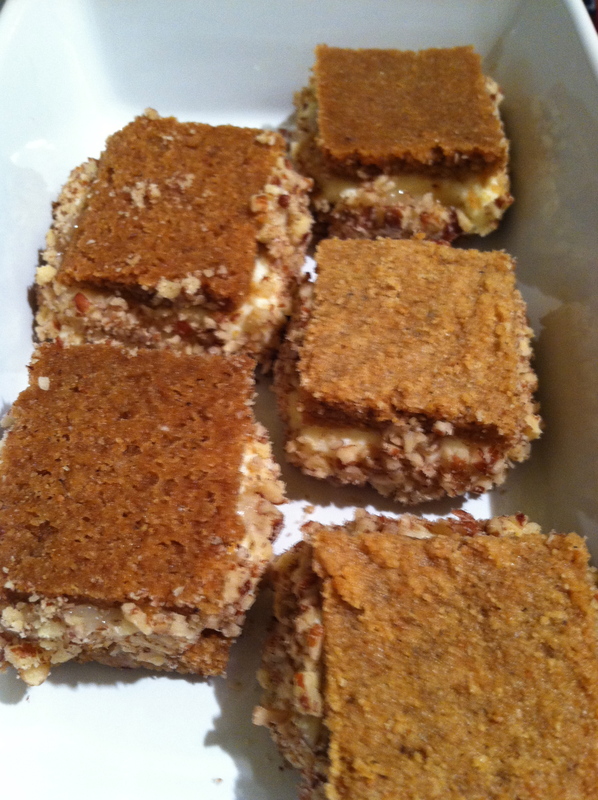 And making them into mini sammies meant double the graham cracker crust. Delightful. I can’t give out my cake secrets, but you can use your favorite cheesecake recipe or buy a small cheesecake and mash the non-crust part with almond extract, and then scoop a teaspoon onto each cookie sandwich. (Click here for the graham cracker crust cookies recipe.) Then spread a little honey on each side and coat with the toasted pecans. These are best served after they’ve been chilled in the fridge for at least a couple hours. Mix thoroughly with a fork until fully combined and moist. Pour into a 9″ x 9″ baking pan and press firmly with fork into the pan until about 1/4″ thickness. Bake at 350˚ for 20 minutes. Remove from oven, and cut into 1-inch squares, then put in fridge for half an hour before using for the cheesecake sammy bites. Treat them delicately, as they can easily break. Tip: For less crumbly cookies, make sure the pan-side of the squares are on the outside of each sammy bite. *Let’s Lunch is a growing global group of friendly, fun food bloggers that meets monthly for a virtual lunch date via Twitter (#letslunch). We share posts on a different topic each time. Our theme was inspired by Let’s Luncher Lisa Goldberg, who has a new book out! 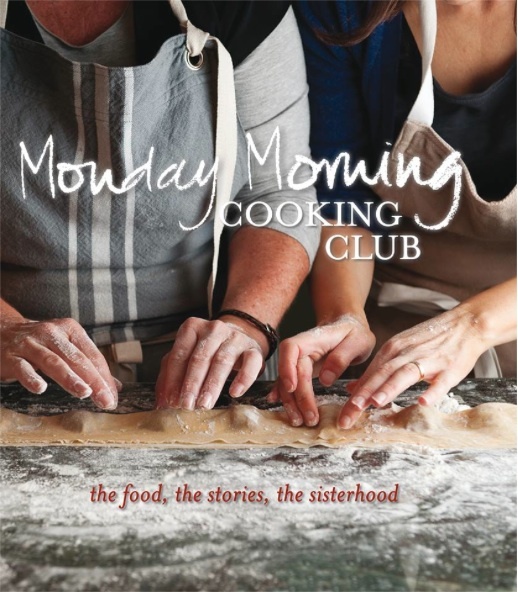 It’s called Monday Morning Cooking Club, after her group of Aussie home cooks specializing in Jewish food. Their goal was to raise proceeds for charity with their recipes. This looks so decadent! I love almond desserts and the double-crust makes it extra delicious. Me too! Marzipan … so good. I adjusted the sugar levels so it’s not cloying. Sending virtual ones your way! 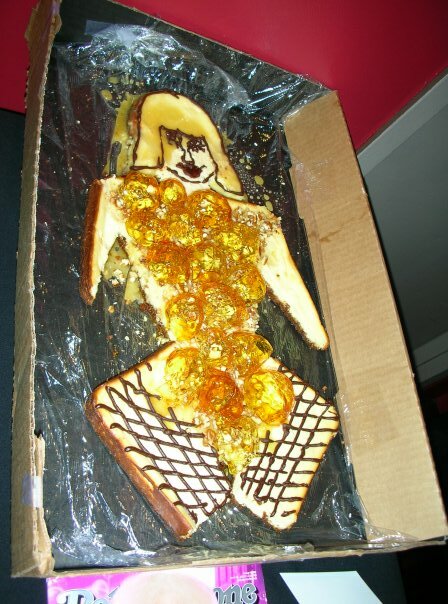 Wow, lady Gaga? You are über talented! Your sandwich surprises are outrageously, fantastically appealing. Another winner. Wow, thanks, Lucy! If you’re ever in the NYC area, I would love to sandwich surprise you! Graham cracker crusts are one of my favorite things in life; I love the idea of doubling up on it! Right? It’s funny, not enough crust has long been one of my minor disappointments in life, and it never occurred to me until this week that I can add more myself! Oh gosh, you had me drooling at the easy way to make these Honey Pecan Almond Cheesecake Sammy Bites. Thanks for sharing. Headed to the pantry shelf to get the graham crackers and try to do this one. Happy to be a part of Lets Lunch! Love the Lady Gaga theme! Yes, I always want more crust too! Pingback: Most Popular Sandwich Surprises of 2013 | sandwich surprise! Pingback: Sans Rival Sandwich Bites | sandwich surprise!